I found this cute couple in the bridal crafting section at Wal-mart. They are dimensional stickers that come in a pack of 12. The accent colors on the stickers match perfectly with The Angel Company’s Amberley Grace 12×12 Cardstock Collection. The small touch of glitter really makes them pop. 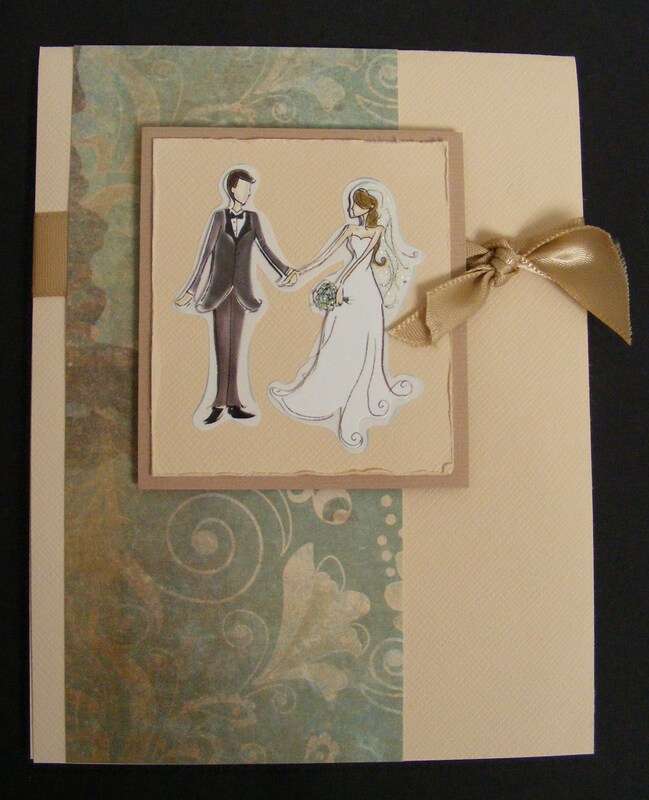 I adhered the bride and groom to a 2-1/4 x 2-1/2 inch piece of cream cardstock from the Amberley Grace cardstock. I distressed the edges and mounted them to a 2-1/2 x 2-3/4 inch piece of tan cardstock. The card base is again the cream cardstock measuring 4-1/4 x 11 inches, folded in half. The Amberley Grace tan ribbon measures about 12 inches and is tied around the card front in a square knot. I adhered the decorative cardstock (5-1/2 x 2-1/2 inches) next, then attached the bride and groom panel with Pop Dots. It is a easy card to make and turns out so elegant. It would make a lovely wedding or anniversary card. All supplies (except stickers) are from The Angel Company. This entry was posted in Cards and tagged Anniversary, bride, greeting card, groom, Wedding. Bookmark the permalink.